The Arabian, the oldest purebred horse breed in the world, was considered a gift from God by the Bedouin society. It had its start in the area now known as Syria, Iran, Iraq and the Arabian Peninsula. Arab is a Semitic word which means desert or an inhabitant of the desert. The lineage of the Arabian horse traces back five thousand years, and although slightly bigger today, the modern Arab is very similar to the original specimen. The specific characteristics of the Arabian all have significant meaning to the Arab nation. The large forehead is believed to hold Allah’s blessings, the high tail carriage is a symbol of pride, while the arched neck and high crest symbolize courage. The dished profile, big prominent eye, large nostrils and fine muzzle are recognizable characteristics. The broad chest, short, strong back and sloping shoulder give him strength and a floaty motion. The breed appear as bays, chestnuts, greys, roans and seldomly blacks. They are normally between 14.1 and 15.2 hands high and weigh from 800 to 1000 pounds when fully grown. A good, affectionate disposition and affinity for humans make it easy to bond with them. Inborn hardiness gives them exceptional stamina and makes them a popular choice for endurance races. Their good disposition makes them very suitable for therapeutic riding. 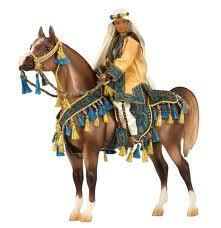 The Arabian became essential to the Bedouin people, and by 1500 B.C. the Arabian horse had been completely domesticated. 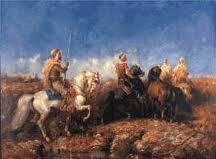 Bedouin leaders were as familiar with the history of their horses as they were with their own verbal history. They depended on the speed, stamina and agility of the Arabian horse in warfare, to enable them to capture the enemy’s sheep, camels and goats. Mares were preferable in this type of warfare (Ghazu), because, unlike stallions, they do not nicker when they see other horses (the enemy’s), warning the enemy of the impending attack. Unlike many breeds, the mares are held in higher esteem by the Bedouin than the stallions. The supreme mares exhibited exceptional courage in battle. In ancient races, the winner of the race received the best horses in the loser’s herd. When a mare was given as a gift, the recipient considered it a great honor. About 3,500 years ago the civilizations of Egypt mixed with the cultures of Mesapotamia. The Egyptian Empire needed the Arabian horses with their speed, endurance and hardiness to reach its borders and rule the vast region. At the time of Mohammed and the beginning of Islam around 600 A.D., the Arabians and their horses spread to the Middle East, North Africa, Spain and China. The Arabian horse was now spreading to Europe. Under Mohammed’s encouragement to the Bedouin soldiers to love their horses, the Bedouin and their steeds became almost invincible. In 868 Ahmad Ibin Tulin, a Mameluke, ruled over Egypt and until 1798, when the Mamelukes were overthrown by Napoleon, the Mamelukes paid intense attention to the breeding of fine bloodstock. In 1798, when Napoleon overthrew the Mamelukes, these beautiful horses captivated Napoleon with their prancing and snorting. When the French left, Egypt was under rule of the Albanian, Mohammed the Great, who founded one of the greatest Arabian stud farms of all time.